I’m in need of a morale boost this month. I made a distinctly wrong decision by stepping on the scale last week. Not a good idea. I’m in need of dropping quite a few pounds. I KNEW those tight pants were telling me something... Against my hopes, it was not an evil conspiracy hatched by the clothes washer and dryer. I have an ugly habit – I’m a boredom eater. While sitting in front of the TV in the evening, my oft-time companions are ice cream, cookies or potato chips. Kind of like the twins in The Shining with an extra sister... So I’m starting to pay much more attention to what I eat. I know that January is the “guilty” month so weight loss is what we’re being pedalled by the media. But this morning on CBC Radio the hosts were talking about weight gain and age, and how people of my vintage start to see changes in body shape. The browned chicken balls, onion and garlic. Great. Just great. But I will not go down without a fight. I may even pull out the big gun in this battle: exercise (shudder). I’m a rather sedentary creature—even more so since Henry our dog passed away—which I know will come back to bite me in future if I don’t do something about it. So I have a lot on my plate, metaphorically. But I will succeed. And the first step is what goes into my mouth, as opposed to that which falls out, like this post. This is an “under 500 calorie” dinner. I succeeded and it was quite delicious and filling, to boot. You don't really have to suffer while watching what you eat. I’ve broken out the calorie count for each ingredient (number is for whole ingredient) so you can see where the big calorie items are. Those with zero or one calorie are not listed. Six servings does not give heaping platefuls, but the rice and chicken are quite filling, and the sweet fruit rounds it all out nicely. the meat, but also partially re-hydrates the fruit as steam collects. otherwise would not have. It makes it more of a "meal." Combine the rice, stock, water and salt in a saucepan. (If stock is heavily salted, omit salt). Bring to a boil, reduce heat to medium low and cook for 45 min, or until about half the rice has begin to split open. 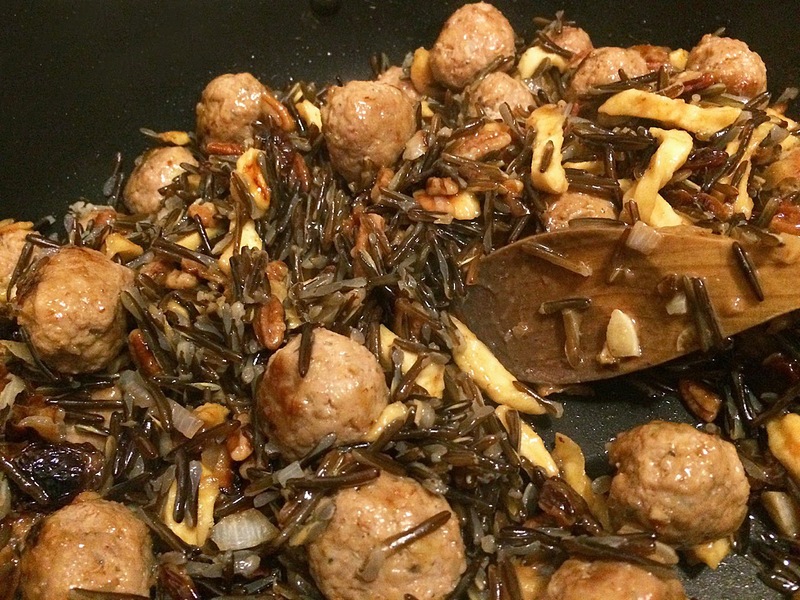 While the rice is cooking, make the chicken balls. Mix together all the ingredients listed for the chicken balls. Using slightly moistened hands, roll into 3/4” to 1” balls. Heat the oil in a wide sauté pan with a lid. 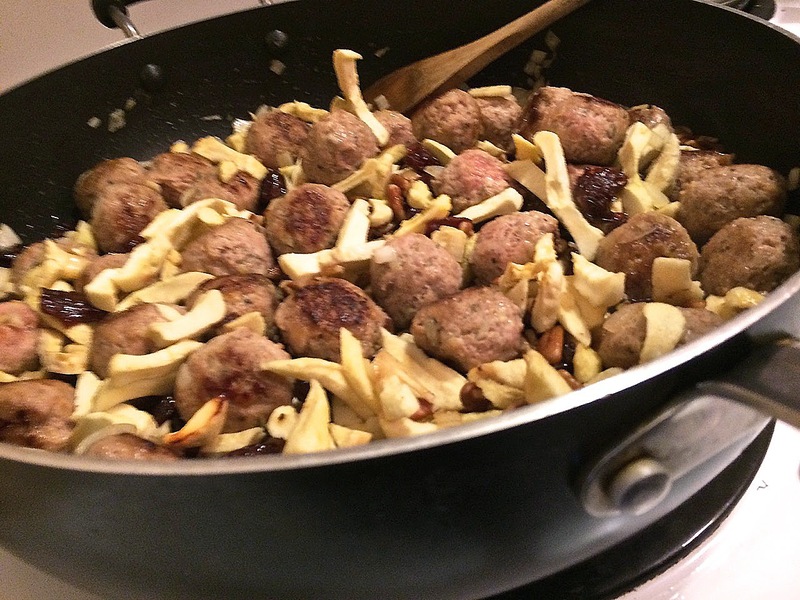 Cook the balls until browned, being careful not to break them apart as you turn them. Then add the onion and garlic and sauté until slightly softened. Reduce the heat to medium low. Add the pecans, apple and cherries and cover. 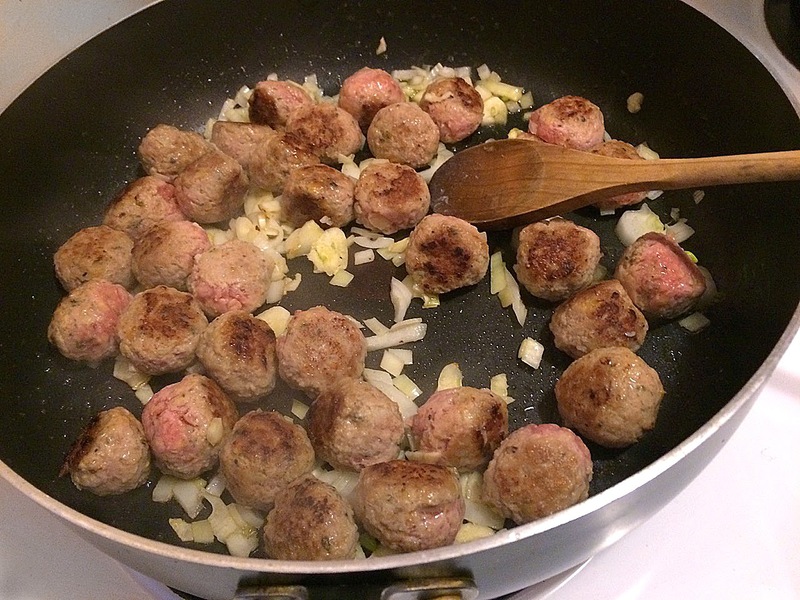 Let cook for 5-6 minutes, until chicken balls are cooked through. Mix together the orange juice and cornstarch. Add to the pan and cook until thickened. Drain rice, carefully fold together and serve. this looks good and healthy too. 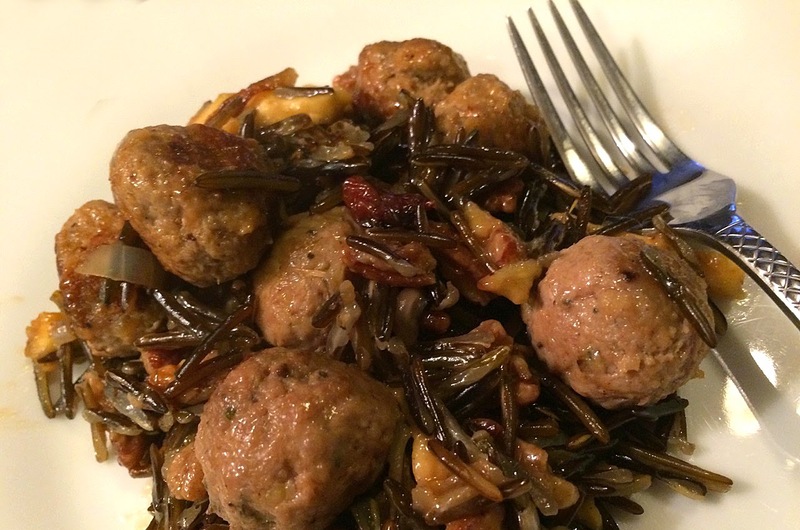 i love wild rice! good luck on your weight loss!